Hummingbirds build their nest out of plant fiber and spider web silk. The spider silk not only holds the nest in place, but it also allows the nest to stretch as the baby hummers grow. 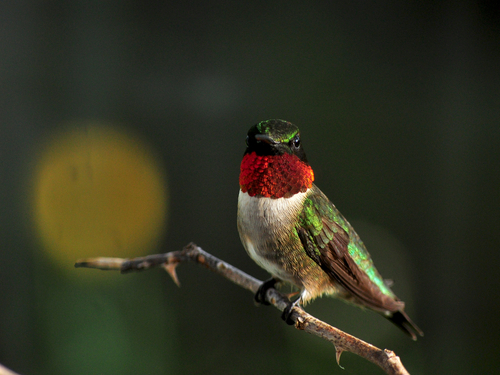 The male Hummingbird does not assist in the incubation and rearing of the young. No, Hummingbirds do not migrate on the backs of geese….this is a myth. Hummingbirds migrate because it is an innate, genetic instinct. Weather, fat accumulation, hormonal changes, and length of day are some factors that stimulate migration. 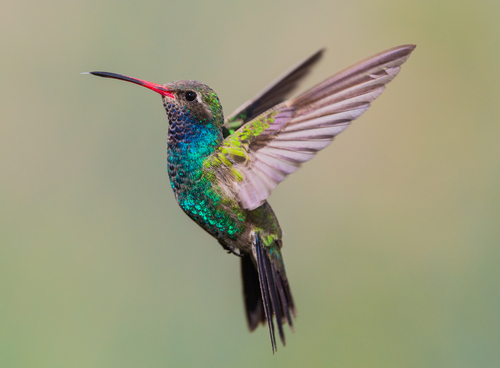 Hummingbirds migrate alone, not in flocks. 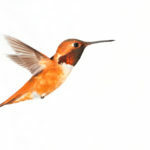 Your feeder will not make a Hummingbird fail to migrate in the fall. Leave your feeder out until mid October. Hummers have fabulous memories…they can remember which town, which street, which yard, and which tree branch had the feeder the year before. If they survive migration, they will return to look for it again. If they return and the food is spoiled, they’ll remember that, too. Hummers have 2 food requirements, protein and nectar energy. Protein comes from spiders and small flying insects. 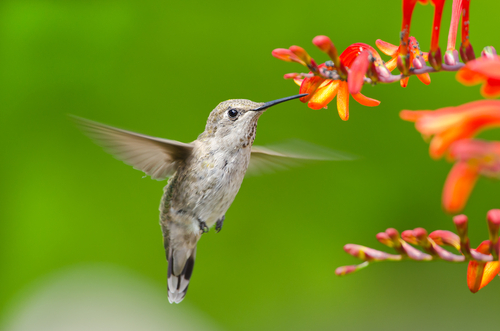 Their nectar comes from flowers and, of course, our feeders. A hummers body temperature is 107 degrees. 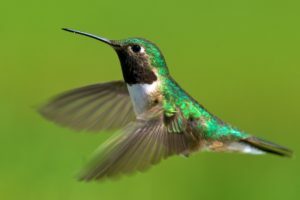 Hummers love to perch, yet have weak feet and can barely walk. 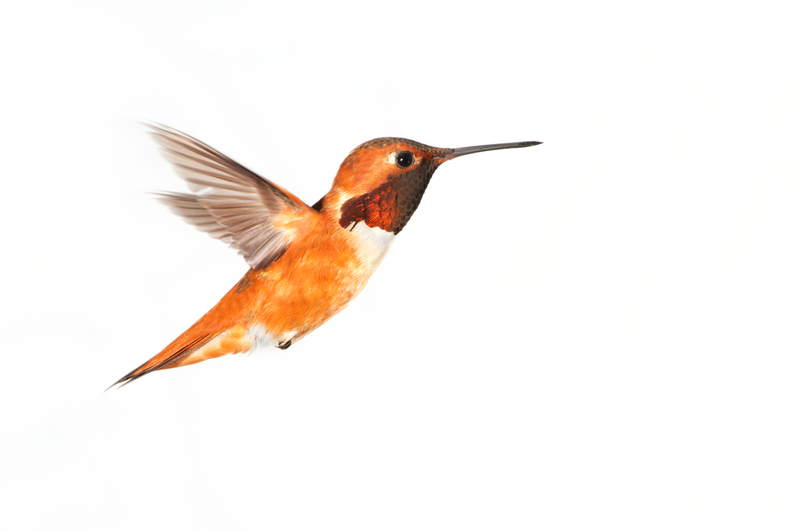 Hummingbirds have no sense of smell, yet hear better and see farther than humans. 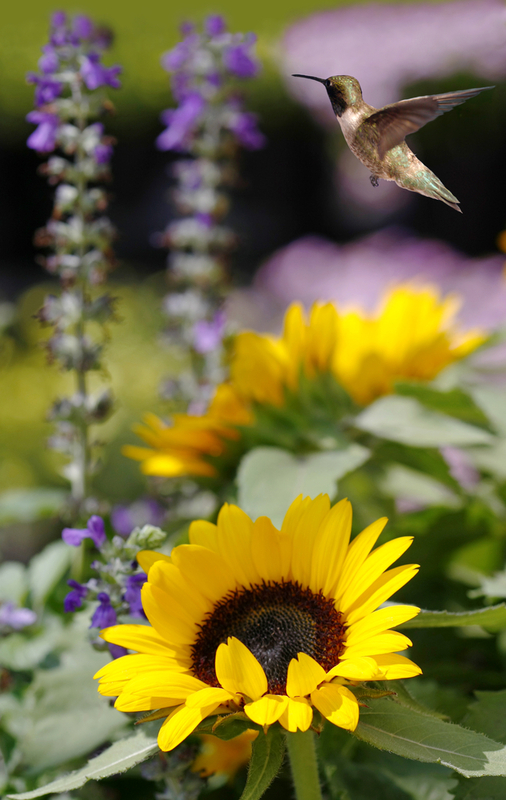 Hummers are very smart and can remember every flower they have been to. Many do what is called “traplining”, where daily they check each previously visited flower. Some hummers (like the Rufous) are peripheral feeders and protect their territory by flying to the outer edges to feed and run off invading hummingbirds. 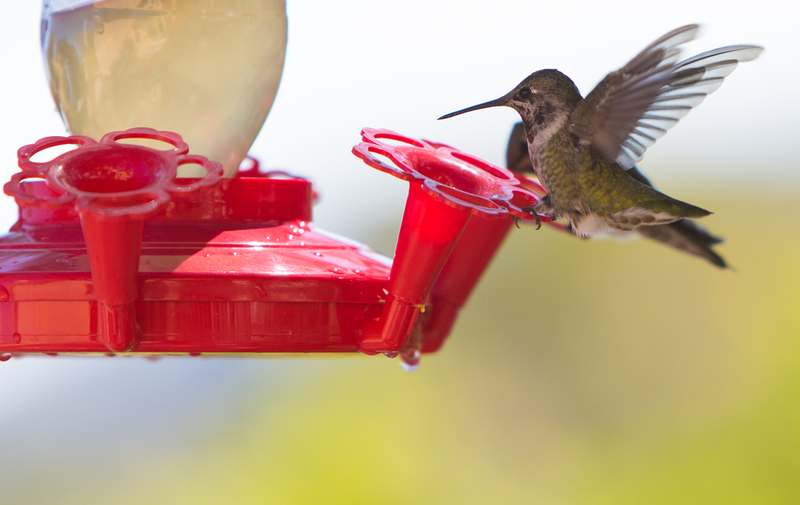 Nectars are digested and passed through the hummingbird system in as little as 10 minutes. 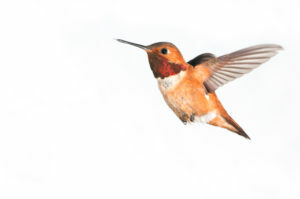 Proper Hummingbird nectar ratio is 4 parts water to 1 part plain sugar. If you have highly chlorinated water, try using bottled spring water instead, but not distilled water. Do not use food coloring, raw sugar, brown sugar, or honey. Of course, NEVER use sugar substitute which provides no calories. Don’t buy and feed commercial pre-mixed liquid nectar…… it’s awful. Store unused nectar mix in fridge. Change nectar every 4 to 5 days, or more frequently as the weather gets hot. Hang in shade to partial shade if possible. Try not to get nectar on outside of feeder, as this will encourage the wasps. 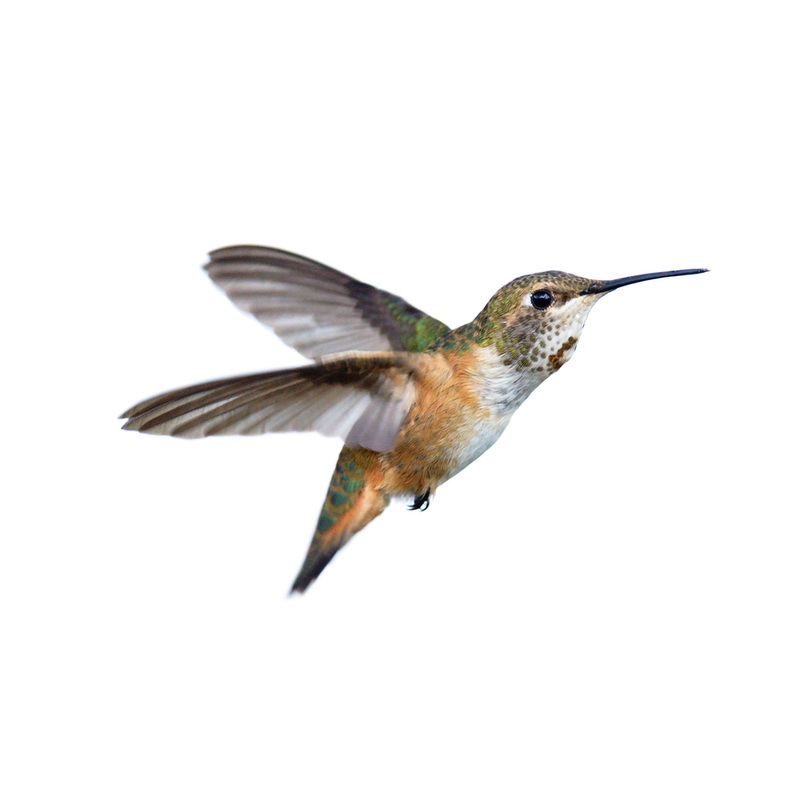 Make sure that your feeder has enough room around it for hummers to hover. 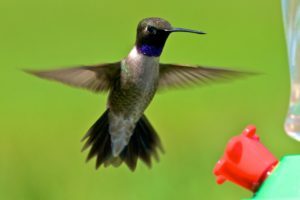 You may need to place your feeder out in a more open area at first in order to attract hummers. Once they find your feeder and are coming to it daily, you can move it closer to where you can observe better. Don’t worry, they’ll find it. Keep you feeder out of reach of cats. House cats kill millions of birds each year. Never hang a hummer feeder near a birdseed feeder. Clean hummingbird feeders with 3 tablespoons of white vinegar to about a gallon of water. Be sure to check for mold. Brush well and rinse thoroughly. 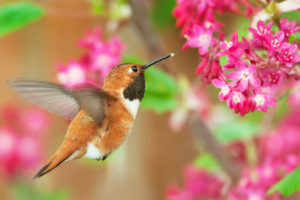 Hummingbirds usually arrive in Idaho between the last few weeks of April and the first week of May. Continue to feed until mid October. Look for an increase in numbers in later August. Late and far traveling migrants really need to refuel somewhere and your feeder can truly help them along their way.